If you have a family member or loved one with special needs, we know that finding quality in-home care is challenging and can often be overwhelming. Selections of services and flexible scheduling enable Helping Hands Healthcare to develop a custom care plan for each client that can be adjusted as clients functional needs change. Helping aging kapunas safely manage and enjoy their life while maintaining their independence. Companionship and monitoring during hospital stays. Whether you are a new or expecting mom or a working parent, Helping Hands can offer the extra support needed to maintain a stress free environment. Taking care of your loved one can be exhausting and stressful when you have not taken time for yourself. 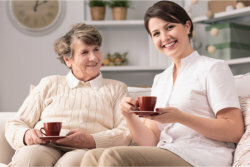 Let us help you by offering respite care to give you that break you need. Recovering from injury or illness can take time; from a few days, weeks or several months. Helping Hands can offer extra help and support so that you may relax and get the rest you need to resume daily activities as quickly as possible.